Every Sunday we gather together for worship, we do some of the same things. We connect with God in a prayer as our worship begins. We sing songs of faith. We read scripture. We listen to God’s word interpreted for our lives today. We sing some more. We pray some more. We give offerings to God. We gather around the Lord’s Table, on the second and third Sundays of the month, and we remember God’s hope and love given to us in Jesus. Some Sundays we baptize. And at the end of our worship, we receive a blessing from God, and we talk about being sent out by God into the world, and then we sing. •	Remember that we are sent, by Jesus, to connect our lives to his through our acts of serving others. This is the fifth Sunday exploring the book of psalms. We began this series with Psalm 1, which is like an introduction to the entire book of Psalms. And, in this introductory Psalm we heard how we are encouraged to be “Like Trees Planted by Streams of Water,” which, in the imagery of Psalm 1 means spending time in God’s Word, and spending time with God in prayer, which really is the goal of the entire book of Psalms. If our lives feel dry and discouraging, this is the way to be refreshed and get growing once again. 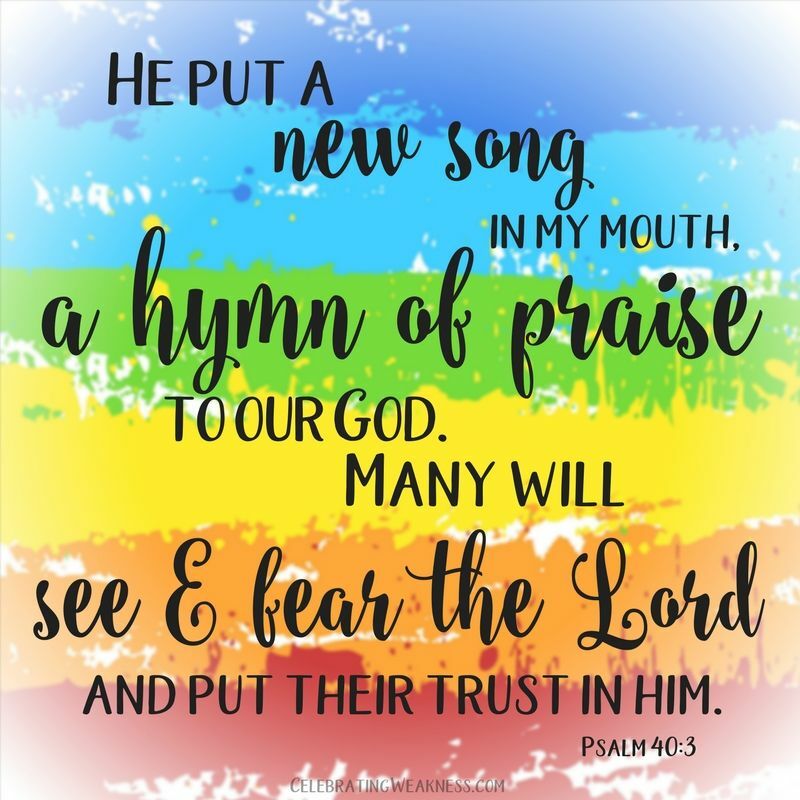 And then, following that first Psalm, we’ve considered psalms of praise, psalms of lament, and psalms of trust…each type of psalm being useful for different situations in life. Today, we read from Psalm 40, a Psalm of Thanksgiving – a psalm to be prayed in a different kind of situation. Please take out Psalm 40, and have it in front of you, as we explore what a psalm of Thanksgiving is about. And here’s the first thing to see: a psalm of Thanksgiving is the kind of prayer that comes AFTER a psalm of lament. Please look at verses 1 and 2 in our Psalm. Notice the imagery of the Psalmist’s trouble and distress. The Psalm starts this way” “1 I waited patiently for the Lord; he inclined to me and heard my cry. 2 He drew me up from the desolate pit, out of the miry bog, and set my feet upon a rock, making my steps secure.” These verses describe the lament part of the psalmists experience – crying out to God in time of trouble or need. And now, please read verse 3 together with me: “3 He put a new song in my mouth, a song of praise to our God. Many will see and fear and put their trust in the Lord.” That’s the thanksgiving part. The Psalmist wants people to see how God has answered his or her prayer for help – and as a ‘result,’ that others would believe and put their trust in God. Here’s the thing. When we pray to God for help, God teaches us through the book of Psalms that it’s important to watch and see how God responds. I can tell you how I prayed and prayed before this recent mission trip with our confirmation youth. And I know you prayed for me. I appreciate that. The trip came on the heels of a busy week for me, and I was feeling exhausted. I didn’t want to go, but I know God wanted me to go. And, God gave me strength, energy and patience. And I am so thankful for that. Thanksgiving means recognizing God’s activity in our lives in response to our prayers and expressing our thanks to God. That’s what separates Psalms of Thanksgiving from Psalms of praise. Psalms of praise are about God’s character in general, whereas psalms of Thanksgiving are in response to God’s specific actions in our lives – how God has helped us in a time of need or difficulty. And we give thanks for that. That’s the fits thing to see about a psalm of Thanksgiving. Secondly, psalms of thanksgiving involve some kind sharing of what God has done – telling others how God has acted. Please look again at our Psalm in your bulletin. I’m going to read verse 9, and then ask you to read verse 10 with me. It’s the last verse of our reading from Psalm 40. And there’s a reason why we are encouraged to do that – because the sharing of what God has done has a great potential to be a blessing for others. When we share the news of what God has done for us, it gives others an opportunity to believe and to put their trust in God, as well. Which reminds me of how important it is for us, to start watching for what God is doing in our lives. For some reason, as Christians, it is easy for us to see the need for God to act, but we have become less accustomed to recognizing when God does act. God may deliver you from a situation – that certainly happened with the Leper in our gospel reading, he was healed of his leprosy. But God may also give you the strength to endure a situation. The strength may come through the consolation of a friend, or the community of the church, or the comfort of prayer. That’s the strength I experienced on the recent mission trip. Or, God may give us the opportunity, in our struggle, to help someone else who is struggling. I was at the Relay for Life. I was asked to give the invocation. How wonderful it was to see the support that people have for each other in their struggle with cancer. Is this not also a signs of God’s active help in our lives, and reason for thanks? We are not immune to pain or distress or suffering, and we are not immune to the evil forces of this world. But we can give thanks for his presence with us amid those troubles, while we wait and hope and pray for that day of God’s complete healing of this world and of our lives. Our waiting in not in vain. Our faith is not in vain. Our prayers are not in vain. God is with us. Let us give thanks for his help in our lives and let us tell others what God has done.